Once you have finished creating a job, you can then begin advertising it. 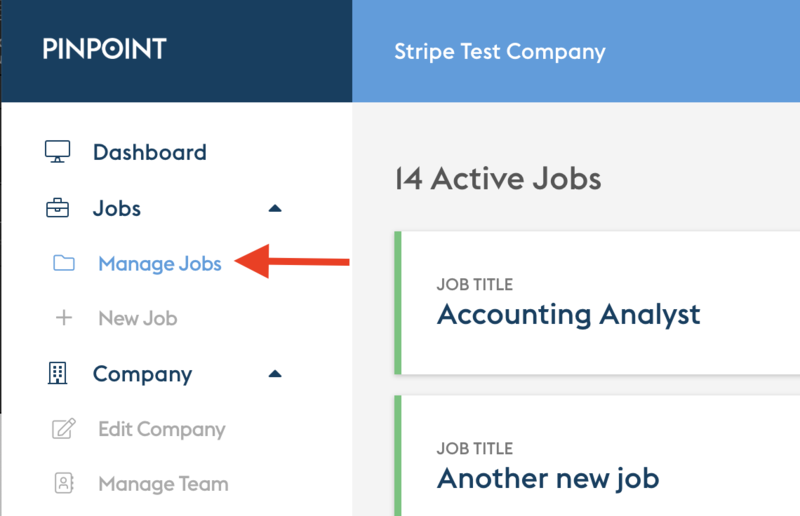 Locate the job you wish to create the ad for and click the job title to open it. You will be presented with a form to fill in. Give your ad a memorable name (this is displayed internally only). 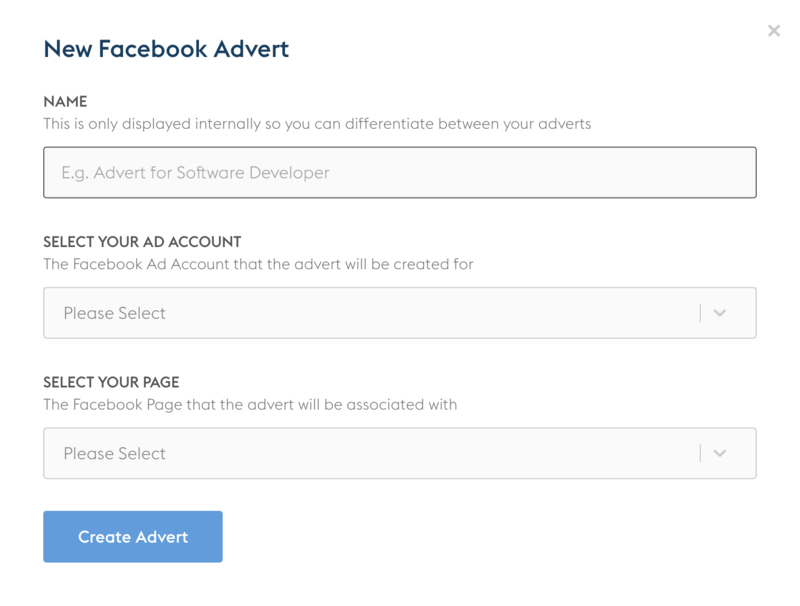 Select your Facebook Ad Account. You will likely only have one option here however it is possible to have multiple different Ad Accounts so select the one that you want to use. Select the Facebook Page that you want to associate the ad with. Again, you will likely only have one option here. 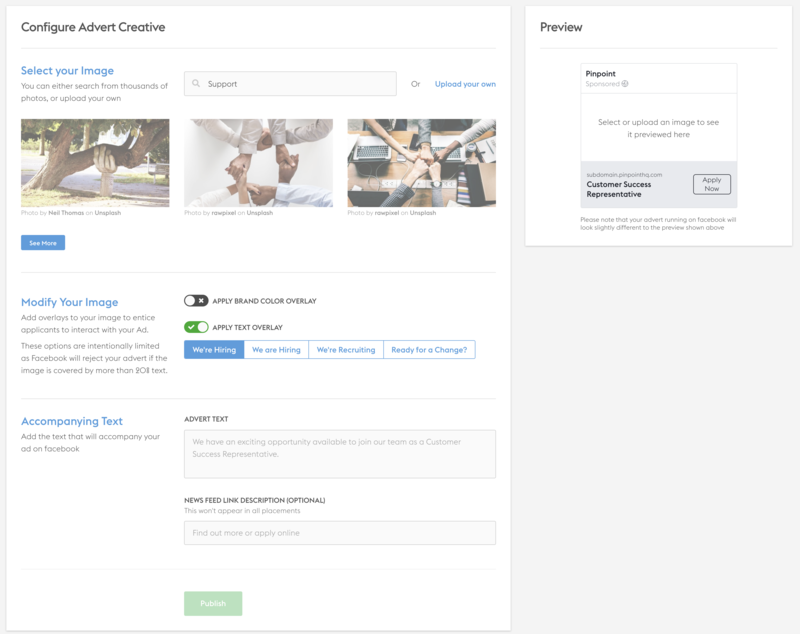 Click 'Create Advert' to move onto the next step. 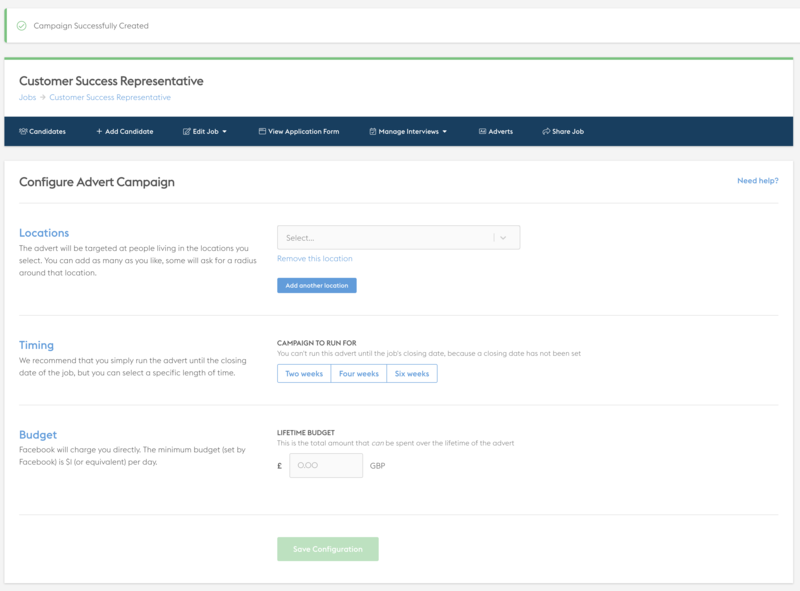 Each ad needs you to set various configuration options in order to run. We take care of most of these in order to make creating the ad through Pinpoint as simple as possible. The configuration options on this form are the things we need you to set. The advert will be targeted at people living in the locations you select. You can add as many as you like, some will ask for a radius around that location. 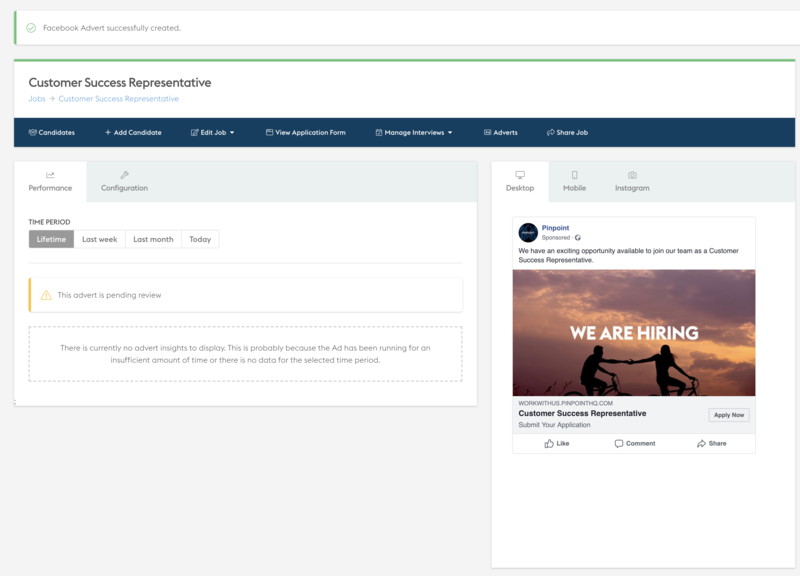 We recommend that you simply run the advert until the closing date of the job (if you have set one), but you can select a specific length of time. Note that if your closing date is very soon or very far away, this will affect how your budget is spent. Facebook will charge you directly, we do not markup these costs. The minimum budget (set by Facebook) is $1 (or currency equivalent) per day. Here, you need to enter the lifetime budget for the ad. Facebook will automatically spread this budget across the duration of the ad. It won't always be able to spend all of the budget, if for example your ad runs for a short period of time or the potential audience is small. Please contact us if you need any help whatsoever with this configuration. Select your image. 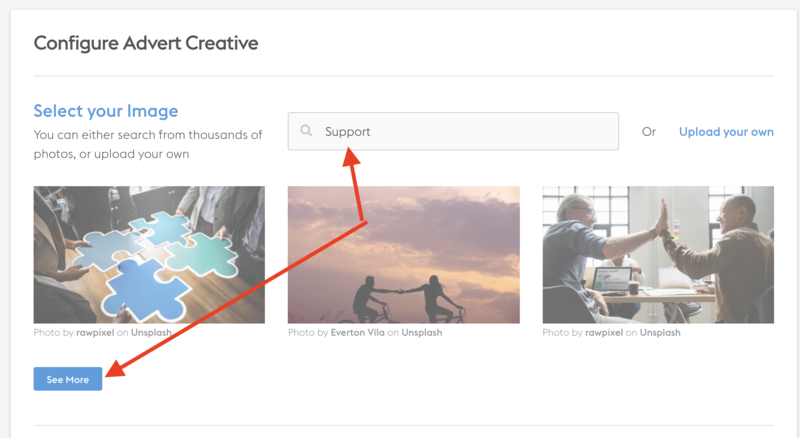 You can search from thousands of stock photographs or upload your own. To search, simply enter a search term relevant to the type of image you want to display, you will then be presented with three images. To view more, click the 'See More' button. There is a live preview that appears on the right hand side of the screen. 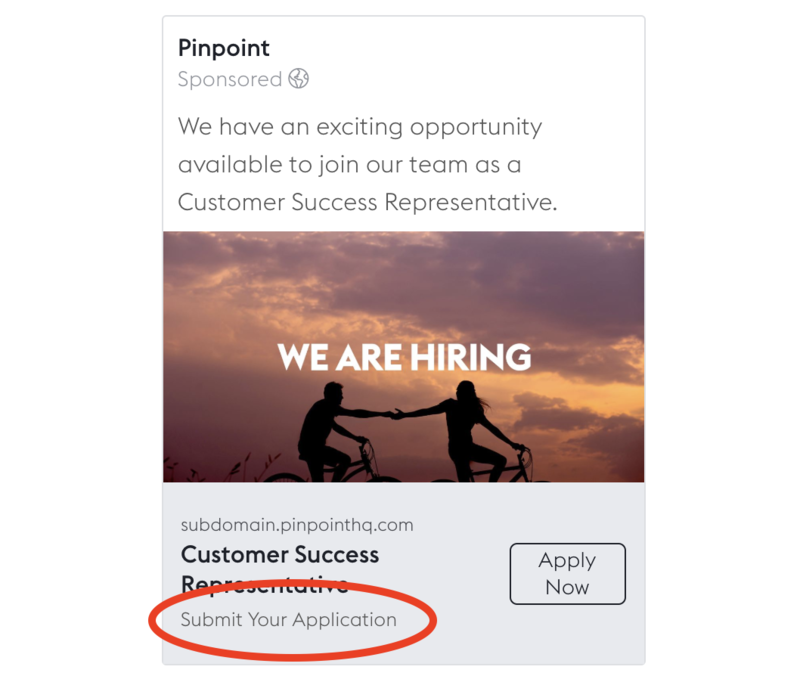 Facebook will usually disallow ads that use words or phrases that target personal attributes or make the user feel like they're being personally targeted. Avoid words like 'You', 'Your', You're' and 'Other'. Your advert will now be reviewed by Facebook to ensure it complies with their policies.